This TAA compliant 4K USB-C™ dock for Mac and Windows® laptops takes productivity to a whole new level, with support for triple 4K monitors - a first in the market. 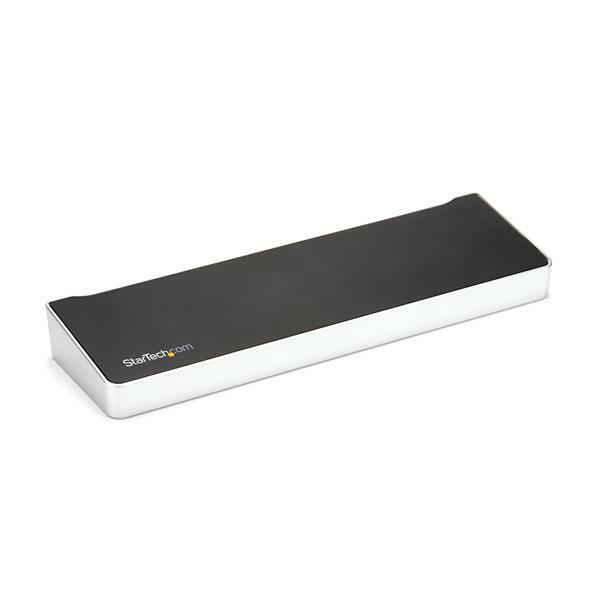 The USB Type-C dock provides 60W charging power, and 5x USB 3.0 ports to connect your peripheral devices. It’s the perfect accessory for your Dell™ XPS 15, Chromebook Pixel™, or another USB-C enabled PC laptop. The dock also connects to USB 3.0 laptops with a USB-A port (using a USB-C to A cable such as the USB315AC1M, sold separately). Note: Power Delivery to charge your laptop is not available through USB-A, and only dual display is supported. 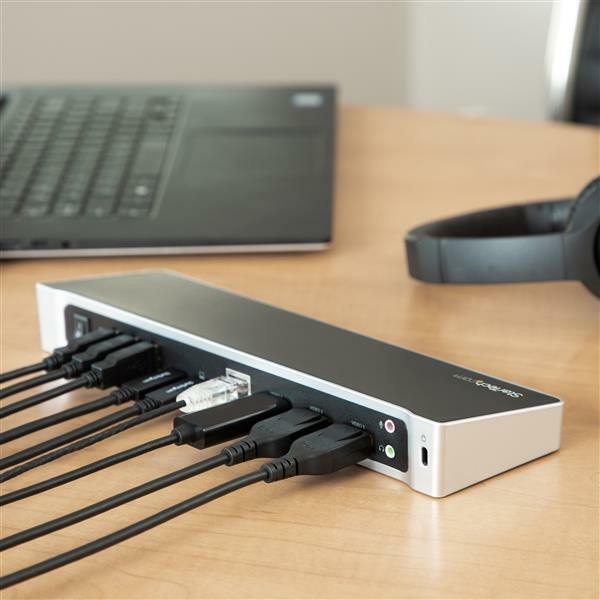 For high-resolution applications, the universal laptop docking station can also connect to a 5K display (5120 x 2880 resolution) at 60Hz, by connecting the two DisplayPort ports to a single 5K display. 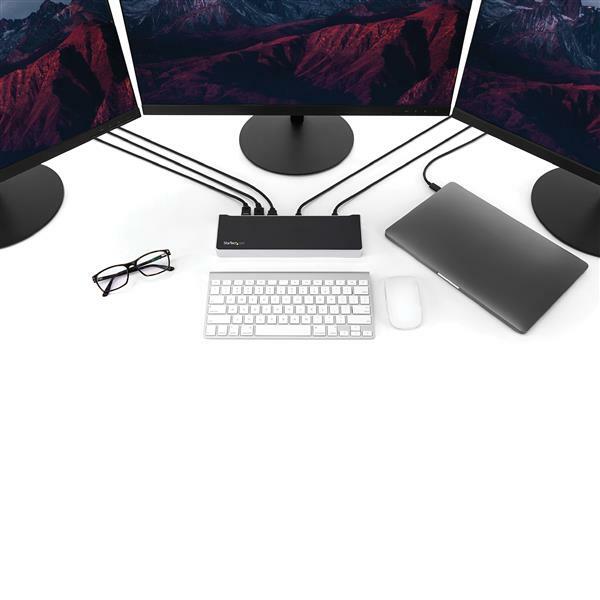 This triple-monitor docking station lets you connect your peripherals to transform your laptop into a full-sized workstation. With five USB 3.0 ports (1x USB Type-C and 4x USB Type-A incl 1x Fast-Charge port), a Gigabit Ethernet port, headset jack and separate 3.5 mm audio and microphone ports, you have all the connections you need for maximum performance. 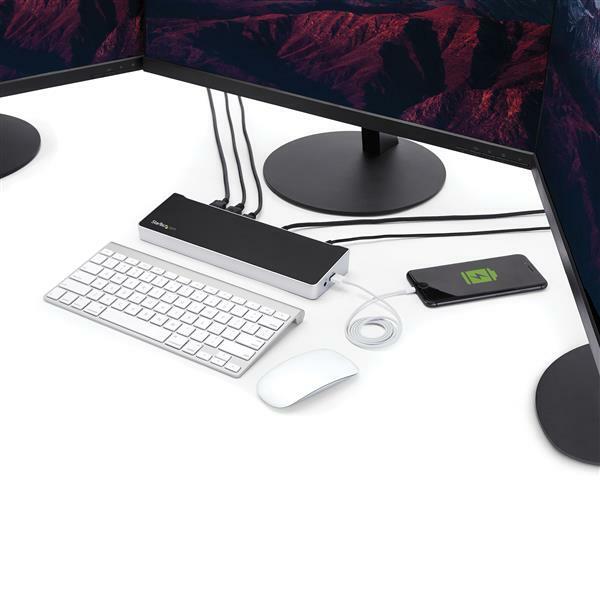 Using a single cable, the USB-C docking station with Power Delivery (up to 60W) will power and charge your laptop, and power your peripherals with its 120W power adapter. 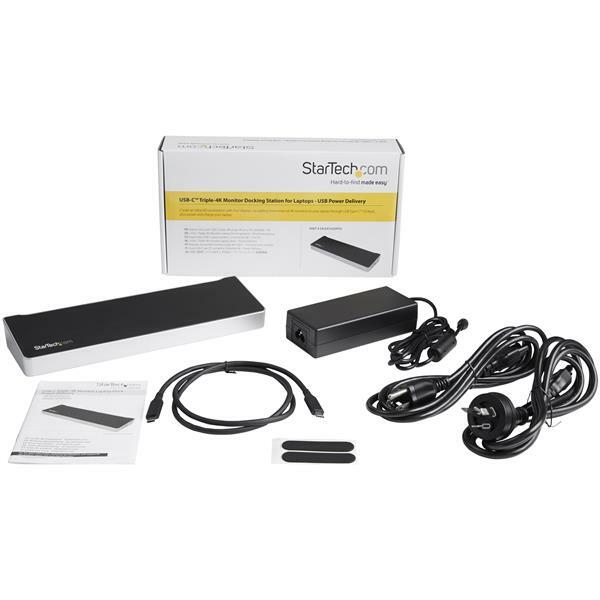 The DK30CH2DPPD is backed by a StarTech.com 3-year warranty and free lifetime technical support. Lower resolutions are also supported. For example, if the max is 3840 x 2160p (4K), it also supports 2560 x 1600p and 2560 x 1440p. Yes, you can use this laptop docking station to charge a laptop computer. 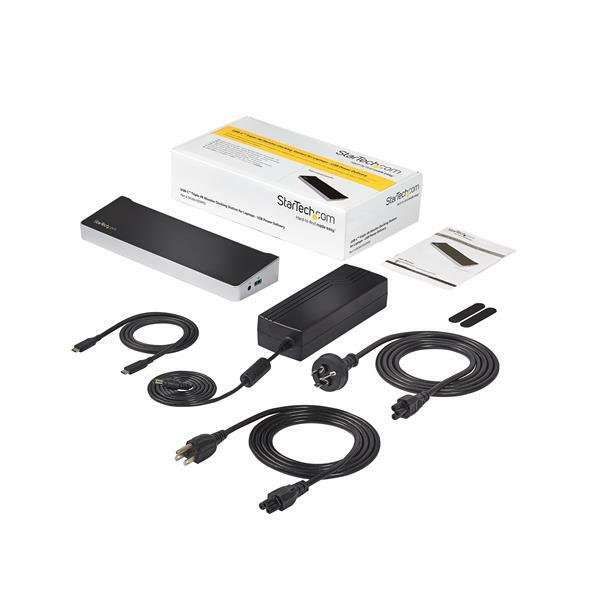 For more information on what the requirements are and about how much power this laptop docking station provides, refer to the product manual. Can I use either of the USB-C ports for an additional display? No, one USB-C port (labelled with a laptop icon) is used to connect to the computer, and the other USB-C port is used for data only. I contacted customer support about various compatibility questions and they go above and beyond helping me out. I have this dock and I'm loving it. Thank you for your review of DK30CH2DPPD. We're sorry to hear you're having difficulties with it and would like to help. The behavior you're seeing is not expected with this product, so we recommend contacting us directly so that one of our Technical Advisors can look into this further for you. You can reach one of our Technical Advisors at 1-800 265-1844 or www.startech.com/chat. (5 stars) Amazing, has all the ports you'd ever need. This dock has been fantastic for me. It's lightweight and easily portable. I have two monitors hooked up to it, one is a 4k screen and the other a 1080p and both work great. This dock actually works better than my unstable Dell TB16 dock. Make sure when you first plug it in to let it sit plugged into your computer for 5 minutes or so because Windows has to go out and look for drivers to install for the different ports. I thought I had a defective unit at first because I couldn't get the Ethernet port to work right away but then after waiting for a little bit it started working and I realized Windows had to install the drivers first. I've tested all the ports and they all work now. One more thing to keep in mind is that the USB-C power delivery is only 60W. Therefore in my case I still needed to have the power adapter plugged into my laptop for the battery to charge as my laptop uses a 120W power adapter. I have a pretty beefy laptop so I won't knock the rating down for that as I'm sure it'll be fine for many laptops out there and in worst case scenario, you just plug in your power adapter too. I received this product in exchange for an unbiased review. 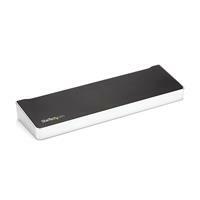 I bought this dock for a new Lenovo Yoga 910. It worked perfectly out of the box, runs a 4K LG monitor and numerous peripherals, was essentially plug and play. Very pleased, my experience with OEM docks has been mixed at best in the past. Good work, StarTech. I have been waiting on this device to hit the market all year and it did not disappoint. I purchased the new MacBook Pro with the USB-C ports earlier this year and have been waiting for a docking station that could handle my extra 2 monitors and could utilitize the USB-C cable to charge my laptop while also passing the data, sound, video, etc. It is simple to hook up and works great with awesome video display ports. It has allowed me to hook up one cable into my laptop each morning. This device would get a 10 out of 10 rating.